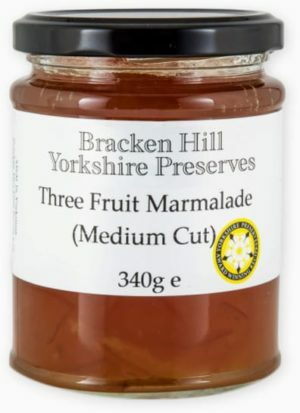 Winner of Gold at the Great Taste Awards and also won at the World’s Original Marmalade Festival 2011. A blend of Seville oranges, lemons and grapefruits. A breakfast treat for all the family. Sugar, Oranges 22%, Lemons 12%, Grapefruits 11%, Gelling Agent: Fruit Pectin, Citric Acid (Prepared with 45g Fruit per 100g. Total sugar content 67g per 100g).